Featuring high-level MLB quality and a format that again only includes hits, 2018 Topps Tier One Baseball packs two autographs and one relic card in each box. Although it appears not much has changed since 2017 Tier One, there are some new options and refreshed designs. 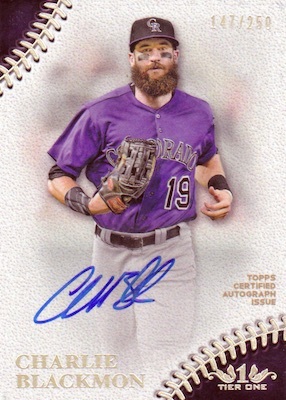 With two signed cards per box, on-card autographs are plentiful in the 2018 Topps Tier One Baseball checklist. Each numbered to 299 or less, the bulk of the hard-signed options come via Prime Performers Autographs, with a baseball-seam design, and Break Out Autographs for up-and-coming players, including rookies. Debuting in 2018, the Tier One Talent Autographs insert covers past and present stars, while specifying a notable on-field attribute from their career. 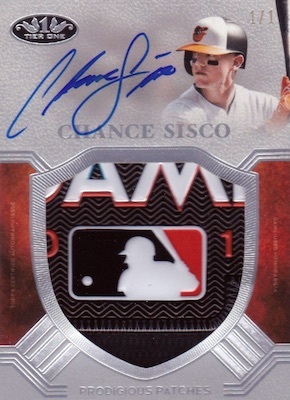 Case-hit Tier One Autograph cards are also sure to impress with a captivating look and on-card signature. All four signed sets include Bronze Ink (#/25), Silver Ink (#/10) and Gold Ink (1/1) parallels. 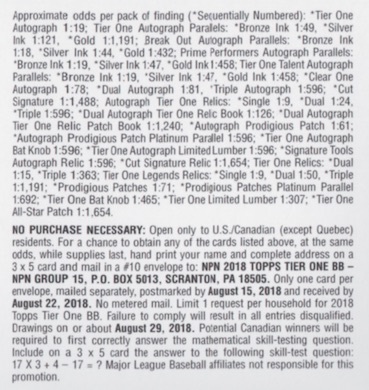 In addition to these choices, 2018 Topps Tier One MLB includes limited Dual Autographs (#/25 or less), Triple Autographs (#/10 or less) and Cut Signatures (1/1). Printed on acetate stock, the Clear One Autograph line only features top current stars and former legends with a print run no higher than 10 copies. Emphasizing game-used memorabilia, the autographed relics in 2018 Tier One come in multiple designs. Autographed Tier One Relic cards match game-worn gear with a signature for over 40 players, plus Dual Relic patch (#/10) and Triple Relic patch (1/1) versions. 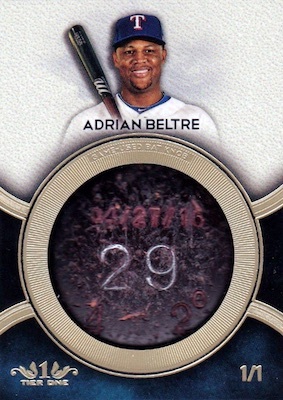 Expanding on that idea are the Dual Autograph Tier One Relic book cards, which also have a Dual Patch (1/1) parallel. 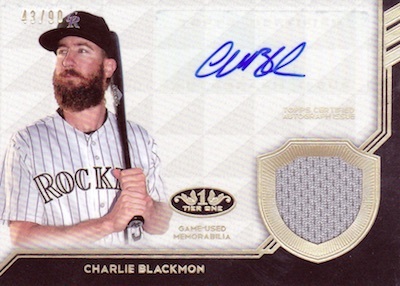 While the standard auto relic cards utilize a smaller swatch, that is not the case for the jumbo Autographed Prodigious Patches. These cards are each limited to 10 copies (or less) for up to 60 players, adding one-of-one Platinum parallels. 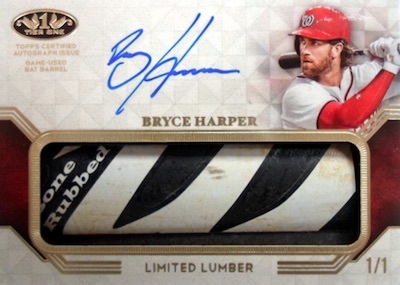 Also one-of-one editions, chase pieces are found with Tier One Autographed Bat Knobs, Tier One Autographed Limited Lumber and Cut Signature Relics, all containing game-used memorabilia. Making the actual pen used in the signing the displayed item of note, Signature Tool Autograph Relic cards bring collectors even closer to the experience. Closing out the release, each 2018 Topps Tier One Baseball box has one memorabilia card. Most common are the numbered Tier One Relics and Tier One Legends Relics. Both have Dual Relic (#/25) and Triple Relic (1/1) options. 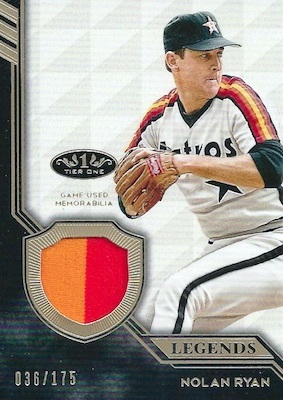 Limited to 10 copies, the Prodigious Patches set incorporates oversized jersey swatches for current players. These have a one-of-one Platinum parallel, as well. 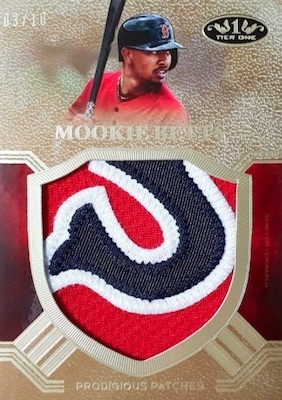 Collectors can also try their luck hunting Tier One All-Star Patches (1/1), Tier One Bat Knobs (1/1) and Tier One Limited Lumber (1/1) cards. Ozzie Albies and Chipper Jones 2018 Topps Tier One Dual Auto 07 25 BV $600! 2018 Topps Tier One ROGER CLEMENS 1 1 Gold Auto! Shop 2018 Tier One Autographs on eBay. 37 cards. 1 per case. Serial numbered. PARALLEL CARDS: Bronze Ink #/25, Silver Ink #/10, Gold Ink 1/1. 79 cards. Serial numbered #/299 or less. 91 cards. Serial numbered #/299 or less. 73 cards. Serial numbered #/10 or less. 77 cards. Serial numbered #/299 or less. 10 cards. Serial numbered #/25 or less. 3 cards. Serial numbered #/10 or less. Shop 2018 Tier One Autograph Relics on eBay. 49 cards. Serial numbered #/100 or less. PARALLEL CARDS: Dual Patch #/10, Triple Patch 1/1. PARALLEL CARDS: Dual Patch 1/1. 35 cards. Serial numbered #/10 or less. 37 cards. Serial numbered 1/1. Shop 2018 Tier One Relics on eBay. PARALLEL CARDS: Dual Patch #/25, Triple Patch 1/1. PARALLEL CARDS: Dual Relic #/25, Triple Relic 1/1. 65 cards. Serial numbered 1/1. 100 cards. Serial numbered 1/1. 44 cards. Serial numbered #/10. 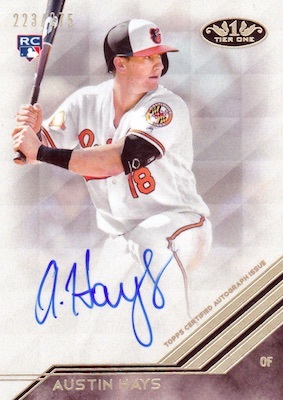 Good: Cards look great and all are numbered; quite a few big-time hits possible; many on-card signatures. Bad: Bloated autograph checklist in main sets; largely worthless base relics; classic gamble product. 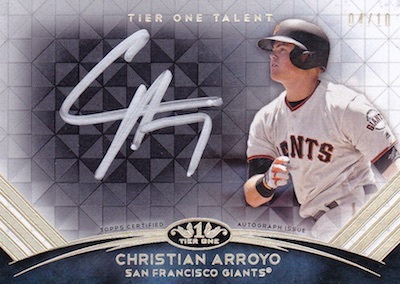 The Bottom Line: Because the cards look impressive and there are some huge hits in play, 2018 Topps Tier One Baseball is an intriguing gamble. However, low-value boxes are common and that can quickly get old at $120+ for three cards. 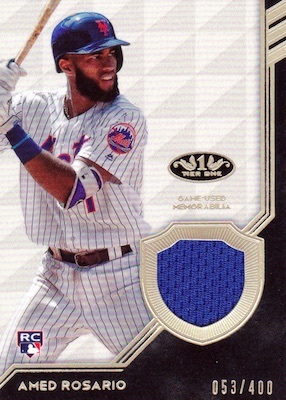 To me, 2018 Topps Tier One Baseball displays a design quality that may even exceed the price point. All the card stock is very thick and the designs are ornate with gold foil accents. Although there is a pretty big selection, it seems most boxes deliver from the same few autograph inserts. These are the signed cards with the largest print runs, so it's not that surprising. 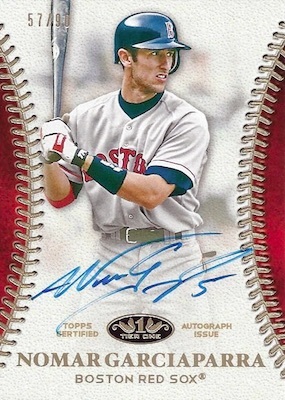 Of the Tier One Talent, Prime Performers or Break Out Autograph designs, I prefer the Talent but all are hard-signed. I do think the Break Outs insert limits the signing area too much with the trio of foil lines. The baseball stitching in several of the options is not my speed, but it doesn't look bad. The most eye-catching designs highlight the jumbo relics, like the Bat Knob, Limited Lumber and Prodigious Patches cards. Of course, these are some of the rarest hits in the release. On the other hand, the main Tier One Relic cards feature the highest print runs and the most pathetic swatches. Since this counts as a "hit" in the three-card box, they can be extra disappointing. 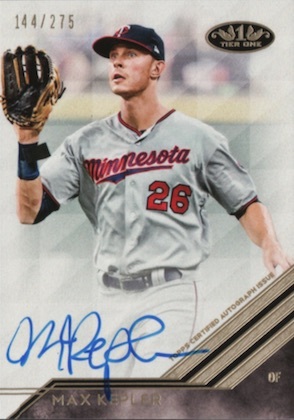 In a word, the 2018 Topps Tier One Baseball checklist is inconsistent. You have tight lists of standout past and present players for many of the limited sets but that shifts wildly with the most plentiful options. This includes Break Outs (91 cards), Prime Performers (77 cards), and Tier One Talent (79 cards), each with print runs as high as 299. This is basically doubled for many players because they have two different versions in the same set. Naturally, Topps fills these out with many of the cheaper players, and these are also the most likely cards to appear in the average box. It does keep box prices in line more, but Shohei Ohtani and Aaron Judge can't provide the same boost to the checklist since each has only one card. 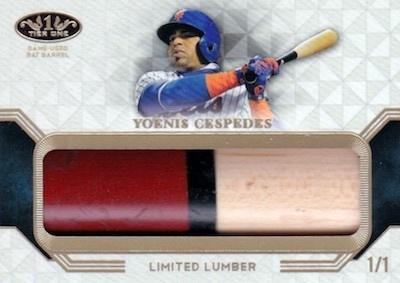 2018 Topps Tier One Baseball is defined by peaks and valleys. It has some legit four-figure cards in the checklist and plenty of autographs and relics worth just a few dollars on a good day. Based on how much other premium boxes can run, Tier One is more of a mid-level gamble at around $115-130 per box, at the time of this review. Still, it is a pretty big risk to blindly spend that amount for two autographs and a relic given the checklist. Even though all the cards are numbered, to end up with a sticker autograph card, small relic card and on-card autograph (that all add up to roughly $15-25) in a $120+ box is tough. This seems to be the norm and most would be better off pursuing another means of acquiring the cards than opening a few boxes. This format is not really geared to those who are opening a box or two. That can explain the limited fun of a three-card box. From a quality standpoint, the set excels and this is arguably the biggest draw other than a shot at a big hit. As the format is based solely around the hits, that is what ultimately dictates much of the fun. Once you fully digest the selection in front of you, it is easier to see why most won't end up with a "fun" box. Where is the checklist? would like to see who is in this product before preorder. While I can’t say I’m overly excited about this product, I think they will be a lot nicer in hand than on screen. FYI for all who didn’t know, this product was pushed back until May 23rd. I am excited about the Canseco bat knob and limited lumber cards! Even though Tier One is the ultimate gamble of a product the cards are usually pretty nice and the potential of a monster box is too great to usually pass up. I feel more satisfied opening a box of this than I do opening a box of the more expensive Museum Collection or Tribute especially because the quality of hits tends to be the same just one less than those two products. I am glad that they only included one Ohtani auto in the checklist so it should keep prices in check and honestly there are still really good rookies in this set, even with 1 Ohtani and no Acuña, that tend to be overlooked right now. Wow! At least 90 percent of this is complete, utterly worthless, unsalable junk, as usual. And only one Ohtani and one Judge autograph. Pass once again. You have to be nuts to go for this. And millions of you will prove that once again. Interesting to see Ken Griffey Jr. autographs in this product. Since he signed with the new company, his autograph signings have been in up in the air. 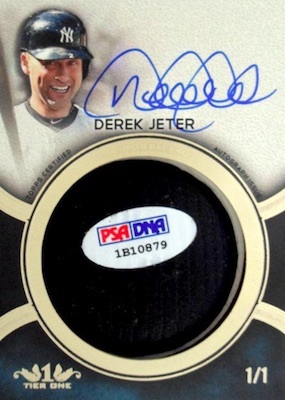 I’m waiting on a autograph redemption of him from 2017 Topps Finest…..
Busted a case. The comment about 90% of these autos being worthless is pretty much true. If I was reselling I would lose a huge amount of money. Totally stupid for busting these boxes. Live and learn. You only get one pack (3 cards per box)? Seems like a rip off for 3 cards or is that a typo? The product only has autographs and relics with just three cards per box. Thought this product paid off pretty well. Pulled a Roberto Alomar Limited Lumber 1/1 out of the six boxes I bought. Can confirm that the box I purchased just today had 4 cards in. 1/1 auto dual relic a relic and an auto. The checklist for all the high end products is so bad now it ruins the fun of breaking. The same players recycled through all the products like usual, just buy what you like based upon design. I’m pretty much certain I won’t buy any more boxes or packs this year as the price is simply outrageous and I don’t want my 19th Ben Gamel, Raimel Tapia, or Matt Duffy auto. At least the design is really nice but no value, no fun, and no money to waste on junk 120$ packs. Topps ought to be a shamed I finally get a chance to buy an upper tier hobby product and the three cards I got wouldn’t even cover the gas I used going from orange beach to Pensacola to find a damn hobby shop an hour away. Piss poor! agree with sweetleftyswing, the difference between high and low is crazy ridiculous, I got lucky and am happy with my Andy Pettitte auto relic, one of my favorite Yankees! while the base cards are nice and all, it is over priced. I feel fortunate that I wasn’t in the ‘dud’ category on this one considering the price for a case – but got an Ohtani redemption that pretty much covered half my buy in along with some other nice silver/10 of Randy Johnson and Gary Sanchez as well. 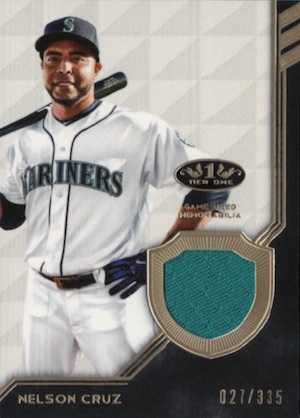 I wish the jerseys were of a better quality than your average 1 per box in topps flagship, but then again you’re really not buying this product for those cards. Alot id throw away cards and even the stars dont fetch much. People seem to push back on sets like this. Unfortunately tribute doesnt get you Mich back and that’s a beautiful set. My best pull is a 1/1 limited lumber suto from Ichiro. 5yrs from now when hes 1st Japanese player in Cooperstown, it might fetch something insane. As all expensive sets it has drawbacks, but that 1 banger can make it worth it. I’m a Pirate fan and got a Honus Wagner(and Jeter) legend relic which was also nice. 2018 Topps Tier One Baseball Factory Sealed Hobby Box. 3 Hits Per Box!